Sakada: Filipino Adaptation in Hawaii, written by Ruben R. Alcantara (University Press of American, 1981), is now available online in a single PDF file. Go to Publications-Books page to view/download: Publications. GUMIL Hawaii Iti Uppat A Dekada (GUMIL Hawaii in Four Decades), edited by Pacita Cabulera Saludes (GUMIL Hawaii, 2011), is now available online in a single PDF file. Go to GUMIL Hawaii webpage to view/download: GUMIL Hawaii. The Filipino-American Historical Society, with the Filipino Community Center, the UHM Office of Multicultural Student Services and the Filipino Association of University Women, will coordinate "FilAm HistoryFest 2012." 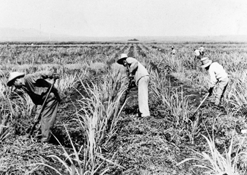 The 2012 Filipino American History Month commemoration will celebrate Filipino organizations in Hawaii. eFIL will expand its digital documentation of Hawaii's Filipino organization by partnering with participating organizations. Notice for event: FilAM History Fest 2012. 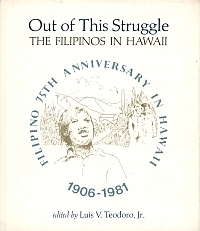 Out of This Struggle: The Filipinos in Hawaii, edited by Luis V. Teodoro, Jr. (University Press of Hawaii, 1981), is now available online in two separate PDF files. Permission has been granted to digitize and distribute two important publications on Filipinos in Hawaii. 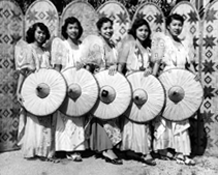 1) Sakada: Filipino Adaptation in Hawaii, by Ruben R. Alcantara. University Press of America, 1981. 2) Out of This Struggle: The Filipinos in Hawaii, edited by Luis V. Teodoro, Jr. University Press of Hawaii, 1981. Processing has started and we hope to have both online by the end of the year.